Normal BMI? But are you Healthy? How many times have you heard people say "I'm thin, I don't need to exercise or diet", or how many times have you said that? Being thin or slim is good but it's not always an indicator of a person's fitness level. Body weight is just one of the indicators of a person's overall health, but not the ONLY indicator! 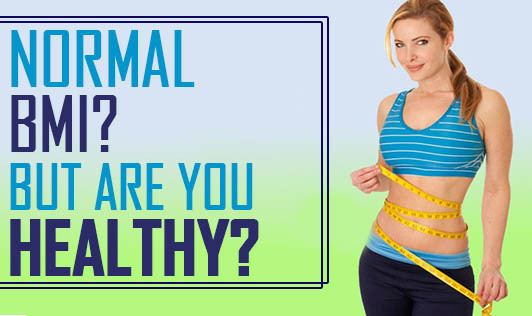 Healthy or unhealthy, fit or unfit, these are determined by factors like body weight, fat percentage, lean muscle mass, waist to hip ratio, and lipid profile. So, having a normal BMI doesn't necessarily mean that you have normal fat percentage or waist to hip ratio. A study conducted by some U.S and European researchers, compared the risks of normal weight people and overweight or obese individuals, and found an interesting result. It was found that overweight and obese individuals are at no greater risk to develop heart diseases or cancer as compared to normal weight individuals as long as they were metabolically fit. This means that, a person with a normal weight can have more visceral fat (fat around the internal organs) than an obese person putting them at a greater risk to various diseases. Exercise: Exercise is important for all, and not only for people who are overweight. Exercise increases blood flow, prevents fat accumulation, lowers blood pressure and gives an overall sense of well-being. Balanced diet: Breaking down your meals to 5-6 meals a day and including foods from all the food groups is essential. Keep the quantities in check too! Hobbies: Take time out for activities you love to do! Also, spend time with your family and balance out work life and personal life. Weight may not be the only factor determining your health status, but it is an important factor. So, it is important to keep your weight normal too!